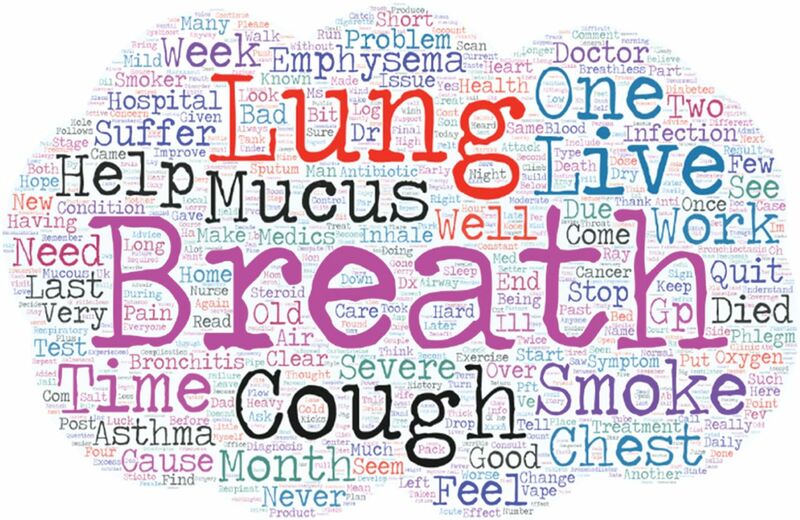 Categorisation of social media posts related to chronic obstructive pulmonary disease (COPD). #: based on article ID, social media link and/or content (e.g. 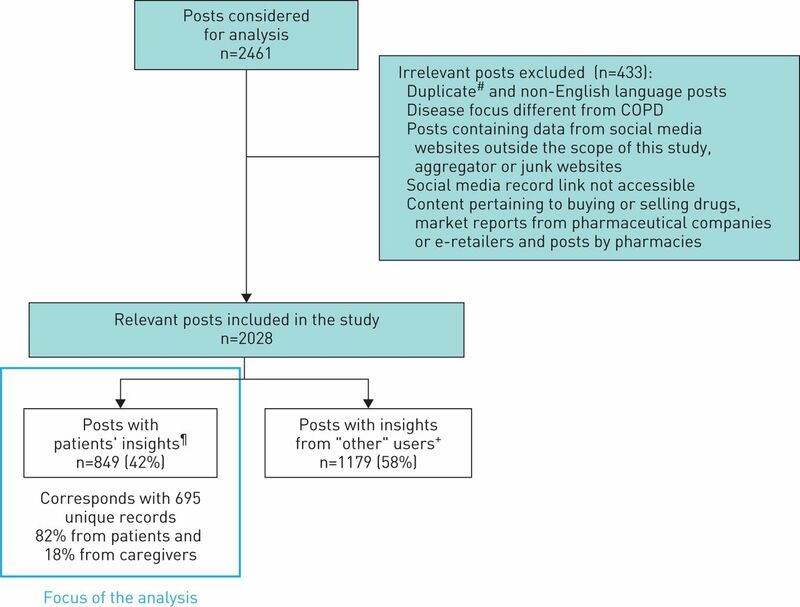 posts with similar content on different social media or re-post by the same user identifiable by content); ¶: description about patients’ perceptions of various aspects of COPD, mainly including, but not limited to, symptoms, diagnosis, management and its impact on their quality of life by “patients” or caregivers was qualified as “patients’ insights”; +: includes users such as healthcare professionals, media reporters, industry personnel, bloggers or nondefined. Mention of common symptoms for a) potential patients or caregivers (n=734 mentions, based on 849 posts) and b) “other” users (n=170 mentions, based on 1179 posts). 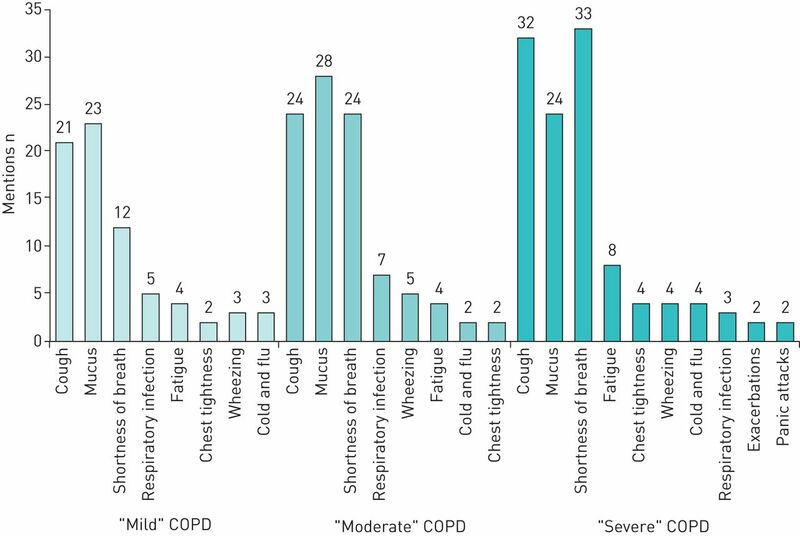 Mention of chronic obstructive pulmonary disease (COPD) symptoms by perceived “severity”. Mention of aspects pertaining to: a) physical quality of life (n=268 mentions) and b) emotional quality of life (n=129 mentions). #: includes chest tightness, hospitalisation and wheezing. 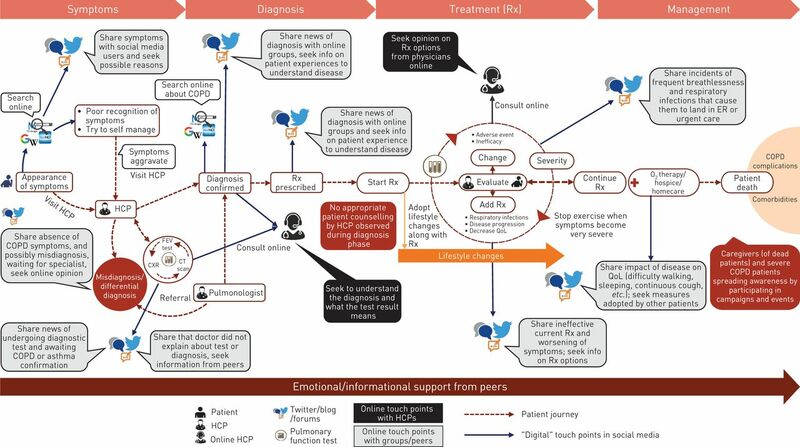 Digital touch points along the patient journey. HCP: healthcare professional; COPD: chronic obstructive pulmonary disease; FEV: forced expiratory volume; CXR: chest radiography; CT: computed tomography; QoL: quality of life; ER: emergency room. A “word cloud” created from collected posts. Data are presented as n or n (%).